If you would like to hire our luxury bell tents then this can be at a campsite/venue of your choosing (including back gardens! 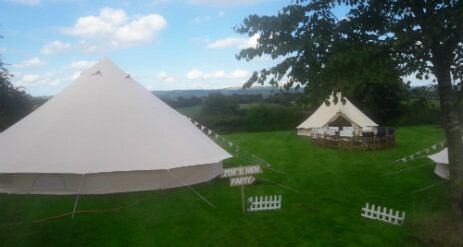 ), at one of our partner campsites or you can have bell tents at a wedding or event we are here to help. We also offer bespoke packages further afield than Derbyshire, Staffordshire and The Peaks, browse our options and please contact us for more details. Go glamping with no need to buy a tent along with all the extras. 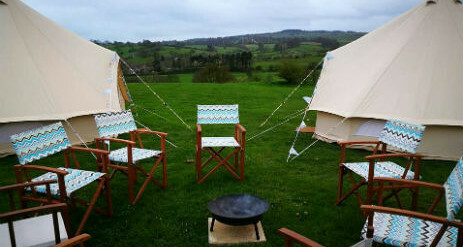 Let us pitch your luxury bell tent and then once you’re done we will take it down again, meaning you have more time to enjoy your glamping experience or event and relax as soon as you arrive. Simply let us know what package you would like to hire, for how long and where and we will do the rest. We have a range of packages to suit your needs. Choose from…. 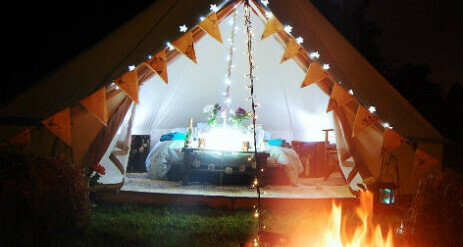 A high quality bell tent, pitched for you with raised airbeds, sheets, blankets, rugs and lighting. Perfect for an experienced camper who wants a comfortable yet back to basic trip. 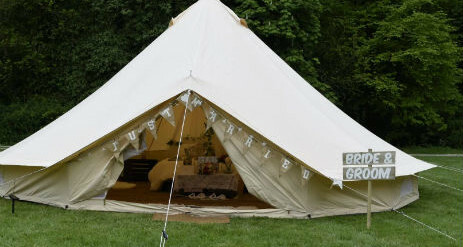 A high quality bell tent pitched for you, with raised airbeds, bedding, blankets, hot water bottles, rugs, lighting, chairs plus more items to make your stay easier. The perfect camping trip where you can pack like you’re staying in a hotel – no camping equipment required! The ultimate package, all you need for a perfect trip to the country and many added luxuries to boot! This is a stress-free package where you don’t have to think about anything. Maximum 4 per tent, we don’t think it’s as luxurious if you are crammed in! This package includes raised airbeds, bedding, blankets, hot water bottles, dressing downs, towels, floor matting and rugs, chairs, plus many more items including a bottle of bubbly! We have teamed up with Wood Farm to offer you a place for an amazing Hen Party. Wood Farm is on the edge of the village of Alton and just 2.5 miles from Alton Towers, if theme parks are your thing, and the Peak Wildlife Park is also nearby. They open up their barn on Saturday nights to let people have a place to meet and they have Karaoke, if it takes your fancy. Included in the price is the pitching and take down of your tents, the site hire in your own private spot, for 2 nights (normally Friday and Saturday, although other days can be booked). 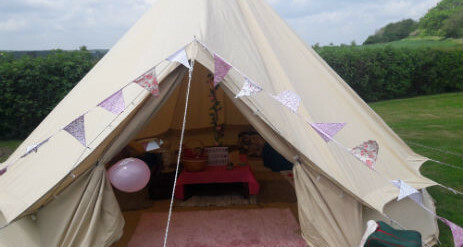 The package includes raised airbeds, bedding, blankets, dressing gowns, hot water bottles, towels, chairs, rugs, tent furniture, lighting and bunting, a fire pit, wood and even a bottle of bubbly per tent! Treat your guests to a night under the stars in our luxurious bell tents. We include everything from comfortable beds and bedding to those all important extras such as towels, phone chargers, dressing gowns and hot water bottles. On top of this, all of our bell tents include a welcome hamper for every guest with complimentary gifts. All tents are pitched ready for your guests arrival at the location of your choosing. 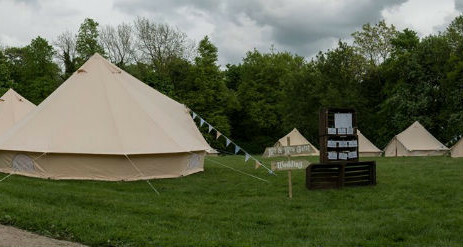 Our tents are suitable for couples, families or groups for weddings, events and any other celebration you have planned. Create your own Glamping village! Weddings and parties can all be a bit too much for some people, so why not add a chill out tent. Decked out with rugs and more cushions than you will ever need, a tranquil space to grab a break. We can also pitch our tents in your back garden for a unique kids party tent. We will stock the tent with toys and games but on top of that there is space to allow up to 10 children to sleep in each tent, although they will need their own sleeping bags/duvets etc. Meaning you can have a whole party weekend, if you have the energy for it, we know the kids will! The minimum space needed is a 7x7m square of grass. We will pitch and decorate the tent for you and take it down after, meaning you don’t have to raise a finger. Bookings are for 2 nights, although if you only want the tent up for 1 night then please let us know. PLEASE SEE BELOW AN IDEA OF OUR CAMPING PRICES, THEY ARE BASED ON 6 PEOPLE SHARING FOR 3 NIGHTS. THESE PRICES DO NOT INCLUDE CAMP FEES.